Steven Smith describes the role playing oral testing which is one of the three parts of the oral testing for the GCSE (General Certification of Secondary Education) in the UK. He describes the activity in which a student asks questions and answers questions.The questions are based on common topics/themes. The same situation can be used at all levels of the language but the language sophistication increases. This type of testing eliminates pre-learned conversations/ presentations. Your teacher will play the part of your French friend and will speak first. You should address your friend as tu. When you see this – ! – you will have to respond to something you have not prepared. When you see this – ? – you will have to ask a question. Tu parles de ton collège avec ton ami(e) français(e). • Ton collège – description (deux détails). • ! Sciences –ton opinion et une raison. • Projet – septembre (un détail). I have done a variation on this activities for many years. Each group of two students sees a photo (projected via PowerPoint) that they have never seen. They role play the situation such as a party, a family at a restaurant, two friends at a sports event,or students in class. One student picks a person in the picture and his/her partner picks another person in the picture. Each student has to ask and answer questions or react about the situation or problem; the goal is a total of ten (different questions + answers/reactions) for each student in three minutes; students need to have a fairly equal number of questions and answers/ reactions. To be counted each answer has to be comprehensible and appropriate. Since I do this activity in pairs during class time, all my students speak at the same time. They record the number of questions and statements by writing a question mark (?) for each question asked and writing a slash (/ ) for each said response or reaction. They try to improve their score each speaking time. During the actual testing, I listen to a pair of students. I find that when students talk to each other, their speaking is more natural, they ask critical questions, and they give authentic responses. They usually pick a topic and talk in depth about it. Sometimes they do one topic and go to a related one such as this restaurant food to food at a birthday party). http://bit.ly/mlcomcult contains many communication activities for beginning to advanced students; the activities have high structure to help students. These activities are for all world languages and specifically for Spanish. World language textbooks do not have real life conversation in any meaningful order. For example, in a college textbook the food unit and the question “How much does it cost?” are in the last chapter covered in the semester. Students wait for over four months to learn the foods and how to say “How much does it cost?” However, if a person actually went to a world language country that person would have to use food vocabulary and the question “How much does it cost?” on the first day! A textbook topic such as “the classroom” is not critical to a real life conversation and yet is is often a very early chapter in many tesxtbooks. Many textbooks use topics that do not produce real life common language conversation; these textbooks prevent students from being able to have a realistic conversation with someone outside the classroom. Do your students learn critical vocabulary for real-life conversations or do they learn vocabulary for classroom based conversations? At http://bit.ly/tpthtuttle, I have 5 any language picture speaking activities and 25+ ready-to-use Spanish structured speaking activities (including 5 Can-Do ones) for beginning students; and numerous students-as-investigators cultural activities(modern language culture). At http://bit.ly/tsmash, I have two ebooks, Modern Language Proficiency: Can-Do Strategies and 90 Mobile Learning Modern Language Activities (mainly speaking and culture).At http://bit.ly/tuttlebks, I have a book, Improving Foreign Language Speaking Through Formative Assessment. What do modern language tests reveal about speaking? Modern language students know that tests are important. They know that the tests measure what the teacher considers to be important. If students have a unit test that does not include a speaking component, then the students learn that speaking is not important. If the students have a speaking test, they know that speaking is important. If students have four unit tests worth 20 points and a speaking test worth ten points, then they discover that speaking is only worth half of what the other tests are worth. Likewise, if students only have speaking tests at the midterm and at the final, they learn that these tests are not as important as the other tests that they have at the end of each unit. The regularity of the testing adds to its importance to the students. In addition, the type of speaking test reveals the teachers’ priorities. If students have to memorize some lines of a conversation and repeat those lines, then the teachers’ emphasis is on mechanical or memorized speaking, not the interactive spontaneous communication of real life. In the same manner, if the teachers grade primarily on the grammatical correctness of each utterance, they focus on grammar, not communication. A suggestion for changing speaking tests is to incorporate speaking “tests” into daily classroom speaking. As students speak with partners, the partners record the number of sentences that they say. After they are done speaking, the partners tell them the number of sentences and suggest other topics that the speakers could have included. For example, a student may describe a family member to his/her partner. What do your tests reveal about the importance of speaking? At http://bit.ly/tpthtuttle, I have 30+ ready-to-use activities (about 24 for Spanish and 6 for all Modern Language) to develop student’s spontaneous speaking starting with highly structured or scaffolded speaking. Students work in pairs to communicate and they usually assess each other. 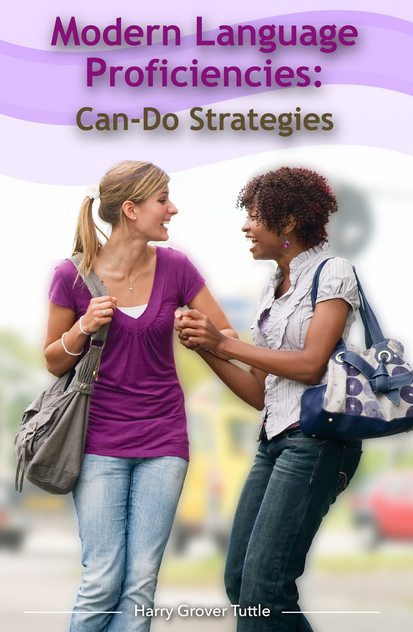 My ebook, Modern Language Proficiency: Can-Do Strategies is available at http://bit.ly/tsmash. It contain many activities to help students advance through the Can-Do statements with half the activities focusing on interpersonal communication/ speaking. Many modern language teachers do not use mobile learning in their class because they worry that not every student has a mobile device. However, the modern language classroom is a cooperative environment. As long as at least half of the students have a mobile device (and they do according to Pew 2012), then students can work in pairs. Even if only a third of the students have mobile devices, then students can work in small groups of three. For example, in pairs or triads, the modern language student who has a mobile device finds a picture of a family member or friend on the mobile device. The other people in his/her group ask questions in the target language about the person in the photo. When the partner has a turn, that partner looks at a different picture of a person and tells information about the person.The person with the photo confirms or negates the information. In pairs or traids, world language students can take a series of five pictures that tell a story by using one student’s mobile device.Then, they combine with another group. The other group narrates the first group’s story and the first group adds any other information to the story. Then they switch roles. How do you use mobile devices in your class to promote student speaking? I have 30+ activities (about 24 for Spanish and 6 for all Modern Language) to develop student speaking at http://bit.ly/tpthtuttle. Oftentimes a modern language teacher such as Miss Windber has to teach a long list of modern language vocabulary words such as forty food words to her students. Her students have great difficulty in learning forty words at once. She starts by dividing the food list into categories such as fruits, vegetables, meat, etc. Miss Windberg prepares an important target language question about food for each group of seven to nine words. As an illustration, she starts off with the question “What would you like to eat?” then she teaches seven to nine of the category words. After her students quickly practice identifying and saying these words, she has her students get into pairs. Each student asks his/her partner in the modern language the first category question of “What would you like to eat?” four times. The partner replies with a different answer each time using “I would like to eat (the food)” or “I would not like to eat (the food)”. For the next set of seven to nine words, she introduces another food question such as “How is the …. ?” and follows the same pattern. The long vocabulary list is broken into the smaller units and every time the students learn or review an important question for the topic. At the end of the vocabulary lesson, not only do they know the forty words but they can ask and answer questions about food in a mini-conversation. How do you teach long list of vocabulary words? 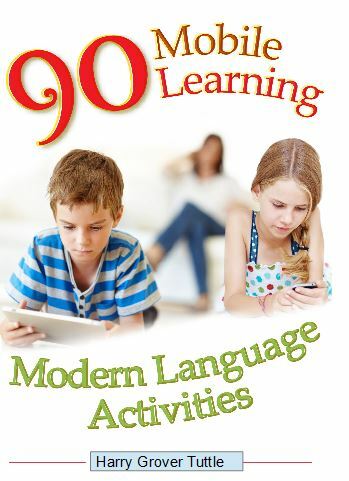 My ebook, 90 Mobile Learning Modern Language Activities, is available at http://bit.ly/90mlact.You can instantly use these many communication activities in your classroom with even beginning students when only half the class has mobile devices. It can be downloaded as a pdf.